The longevity Single Board Computers follow international industry size standards with well-defined mounting holes and standard I/O bracket areas. In addition, Kontron offers many value-added services like detailed documentation, display support and complete life-cycle management. Our Atom-based Single Board Computer offer up to 7 years product availability from the release date, based on embedded key components. In applications where permanence and risk avoidance must be optimized, Kontron’s experience in a variety of markets leads customers to the solution that meets their critical programming and cost objectives. 3.5” ECX Single Board Computer with Intel® Broadwell U-Series Processors. In addition to 2x DP, 4x USB 3.0, 2x USB 2.0 and 8-bit DIO, ECX-BDW-U has three GbE LAN ports, providing users with greater flexibility in Ethernet connectivity. 3.5” ECX Single Board Computer with Intel® Kaby Lake U-Series Processors. Intel® HD Graphics 620 integrated GPU along with one HDMI 2.0 supporting 4K Ultra HD resolutions. 3.5” ECX Single Board Computer with Intel® Bay Trail SoC Processors. 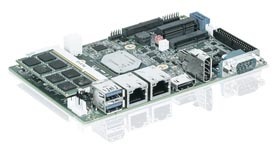 ECX-BYT is a 3.5” Intel® ECX (Embedded Compact eXtended) form factor SBC, equipped with low-power Intel® Bay Trail processors making it an ideal platform for integration into a fanless system. Embedded 3.5" Motherboard with Intel® ATOM E3815 ® CPUs. This 3.5” powerhouse has been designed especially for performance-intensive applications and supports the extended temperature range of 0°C to +60°C.